Okinawa, or "Loo-Choo" as it was known then, had been trading for centuries with neighboring countries. China, Taiwan and Korea - Singapore and the Philippines. It wasn't until the 19th century however that Okinawa was opened up to the West. 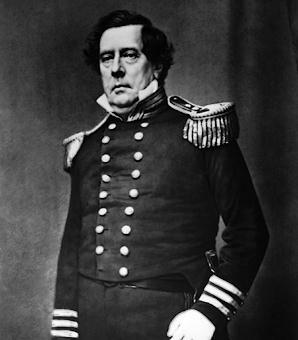 Commodore Matthew C. Perry, commander of the United States naval forces in the China seas, was a staunch expansionist. Back in 1852 he warned President Fillmore that the British, who had already taken control of Hong Kong and Singapore, would soon control all trade in the area. Perry recommended that the United States take "active measures to secure a number of ports of refuge" in Japan. President Fillmore agreed with Perry. In 1853 he ordered the Commodore to open negotiations with the Emperor of Japan. At age 60, Matthew Perry had a long and distinguished naval career. He knew that the mission to Japan would be his most significant accomplishment. Mahan After temporarily resolving the problems of Reconstruction and Industrialization, Americans began to resume the course of expansion. The horrors of the Civil War had interrupted the original Manifest Destiny that began in the 1840s. Now, as pioneers settled the last western frontiers, expansionists looked yet farther to the west -- toward Asia and the Pacific. A leading expansionist, Captain Alfred T. Mahan, cautioned that the Pacific could "be entered and controlled only by a vigorous contest." As head of the Naval War College, Mahan believed that America's survival was dependent upon a strong navy. He argued that a strong navy would require island possessions to serve as naval bases. The time had come, Mahan wrote, for Americans to turn their "eyes outward, instead of inward only, to seek the welfare of the country." American ships had long been active in the Pacific. The New England whaling fleets scoured the ocean in search of their prey. The China trade had been enriching Yankee merchants since 1784. Japan, however, had effectively closed its doors to outsiders, and it restricted foreign ships to a small part of Nagasaki. For over 200 years, no foreigner was allowed to enter Japan at all, even shipwrecked sailors were forced to remain so that no information could leak out. A strict feudal system operated, no details were available about the country. The Dutch had established trading relations with the Japanese in early 1600, but were then forced, in 1641, to remove themselves and all future trading via an artificial island called Decima. This was in the Bay of Nagasaki, it was only 600 feet by 240 feet, with a small stone bridge connecting to the mainland. A strong guard was constantly placed at the bridge to prevent foreigners entering and Japanese visiting. That was the situation until July 8th, 1853 when four black ships led by USS Powhatan and commanded by Commodore Matthew Perry, arrived at Edo Bay (Tokyo), demanding that Japan now open its borders to foreign commerce. Kayama Yezaimon, daimyo of Uraga, raced to the battlement, the clash of the warning gong still ringing in his ears. Stopping beside the brass cannon that guarded the entrance of Edo Bay, he scanned the horizon. The summer sun flashed high above the blue Pacific, and beneath it four ships approached with the tide. Never before had the Japanese seen ships steaming with smoke. They thought the ships were "giant dragons puffing smoke." They did not know that steamboats existed and were shocked by the number and size of the guns on board the ships. As the ships sailed closer, the daimyo, his samurai, and their retainers watched in silent awe. Two huge steam frigates spouted thick black clouds as they maneuvered against the wind. With their paddle-wheels churning the water, the frigates came about, bringing their gun-decks to bear upon the shore defenses. Two sailing ships waited downwind in support. Bright signal flags fluttered from halyards. Masahiro Abe Masahiro, head of the Roju (governing council) under Shogun Ieyoshi Kayama scowled. Through a telescope he studied the ships, which were well beyond the range of his small shore batteries. The ships bristled with cannon much more formidable than his own. Identical flags flapped at the stern of each vessel -- red and white stripes, with white stars on a patch of blue. Kayama barked out an order. A samurai ran forward and dropped to one knee. The daimyo instructed the samurai to ride to the castle of Abe Masahiro, and to inform the shogun that a barbarian fleet blocked the mouth of Edo Bay. From the fo'c'sle of the sloop of war Saratoga, Lieutenant John Goldsborough watched as dozens of Japanese galleys approached the American fleet. They were all fantastically decorated with flags and banners. They were propelled by from ten to twenty oars each with generally two or three men at each oar. None of the boats were permitted to come alongside any ship in the Squadron, though they all appeared quite anxious to go alongside the Flagship. Still none were permitted until we were fully convinced that a high officer was in one of the boats. Then he alone, with an interpreter who spoke Dutch, was allowed to come over the Susquehanna 's side. On board the Susquehanna, Commodore Perry's aide, Lieutenant Contee, informed the official that the Commodore carried a letter from the President of the United States to the Emperor of Japan. The Commodore intended to deliver the letter personally to an official representative. Since the Commodore was of the highest rank in the United States Navy, Contee said, he would meet only with a Japanese official of equal status. Two days later, Kayama Yezaimon visited the Susquehanna. He informed Captain Adams that the Americans must take their message to Nagasaki. Perry refused to meet with Kayama, but he wrote a message. "The Commodore will not go to Nagasaki," Adams read. "If this friendly letter of the President to the Emperor is not received and duly replied to, he will consider his country insulted, and will not hold himself accountable for the consequences." Toda After several more days of haggling, a suitable representative, "Prince" Toda, arrived in Uraga. With cannon salutes and a marching band, Perry led a parade of marines to meet the Japanese delegation. He presented Toda with the president's letter, enclosed in a rosewood box trimmed with gold, and announced that he would return for the emperor's answer in the spring. Perry impressed the Japanese officials with his diplomacy and with the technological superiority of his ships and weapons. The Japanese shogunate decided to grant the minor trade concessions that President Fillmore asked for in his letter. Forming a treaty with the Americans, they reasoned, would prevent another European power from imposing even greater concessions. It is possible that the feudal system was beginning to collapse at this time anyway, and following the Americans visit, there were 21 years of sweeping reforms. 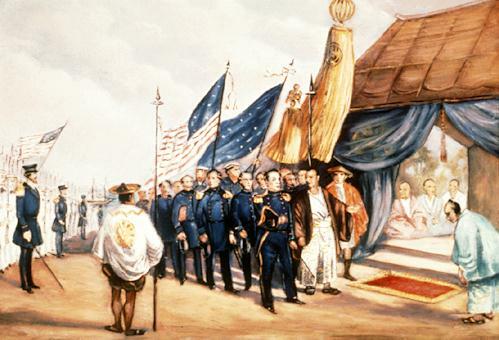 In February, 1854, Perry returned to Edo with eight ships. He accepted the favorable reply to Fillmore's letter and visited several Japanese ports before beginning the long voyage home. His diplomatic mission had officially established the United States' presence in Asia. Still, the Americans never realized that they had been negotiating with a mere shogun. For the emperor to consult with barbarians was unthinkable. After the signing of the treaty, the Japanese invited the Americans to a feast. 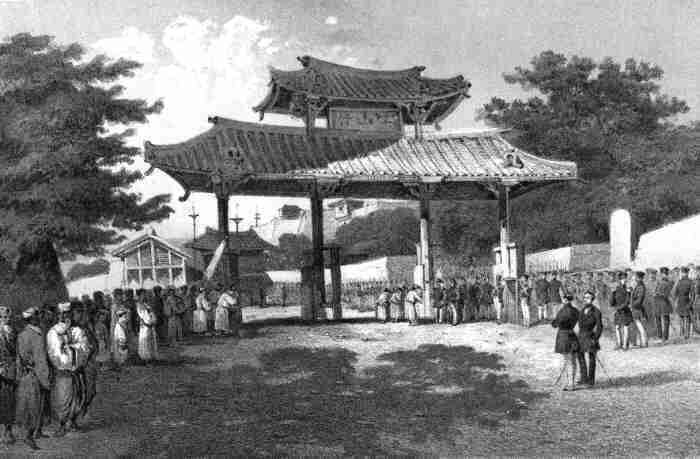 The Americans admired the courtesy and politeness of their hosts, and thought very highly of the rich Japanese culture. Commodore Perry broke down barriers that separated Japan from the rest of the world. Today the Japanese celebrate his expedition with annual black ship festivals. Commodore Perry also put in at Naha, the capital city of "Loo-Choo" (some sources spell "Lew-Chew") - the Ryukyuan island of Okinawa. The inhabitants of Loo-Choo were exceedingly friendly and accomodating. While in the Naha harbor, Perry and his crew remained aboard the ships. One can never be certain, but it is believed that this is an artist's embellishment. Perry, Matthew Calbraith (1794-1858), American naval officer, who commanded the expedition that established United States relations with Japan. Born on April 10, 1794, in South Kingstown, Rhode Island, the brother of Oliver Hazard Perry, he began his naval career as midshipman at the age of 15; he advanced to lieutenant in 1813 and to commander in 1826. He supervised the construction of the first naval steamship, the Fulton, and upon its completion in 1837 he took command with the rank of captain. He was promoted to commodore in 1842. In 1846-1847 he commanded the Gulf squadron during the Mexican War. 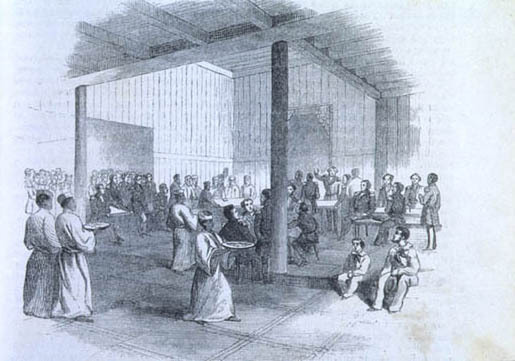 In 1853 Perry was sent on the mission to Japan, a country that had been closed to outsiders since the 17th century. On July 8, he led a squadron of four ships into Tokyo Bay and presented representatives of the emperor with the text of a proposed commercial and friendship treaty. To give the reluctant Japanese court time to consider the offer, he then sailed for China. With an even more powerful fleet, he returned to Tokyo in February 1854. The treaty, signed on March 31, 1854, provided that humane treatment be extended to sailors shipwrecked in Japanese territory, that U.S. ships be permitted to buy coal in Japan, and that the ports of Shimoda and Hakodate be opened to U.S. commerce. Perry's mission ended Japan's isolation, a prerequisite for its subsequent development into a modern nation. Perry died in New York City on March 4, 1858. (c)2001-2018 Webmaster: S.A.Mick McClary Great Falls, Montana, USA.